Hello all, it has been a while since I posted on here, since my last WWF project finished I have been thinking long and hard about a new project and I can finally announce that it will be starting in Jan 2018. While we are waiting for that to start I decided to have a go at making a Porg, the little fluffy creature from the next Star Wars Movie to hit the screens this Winter. 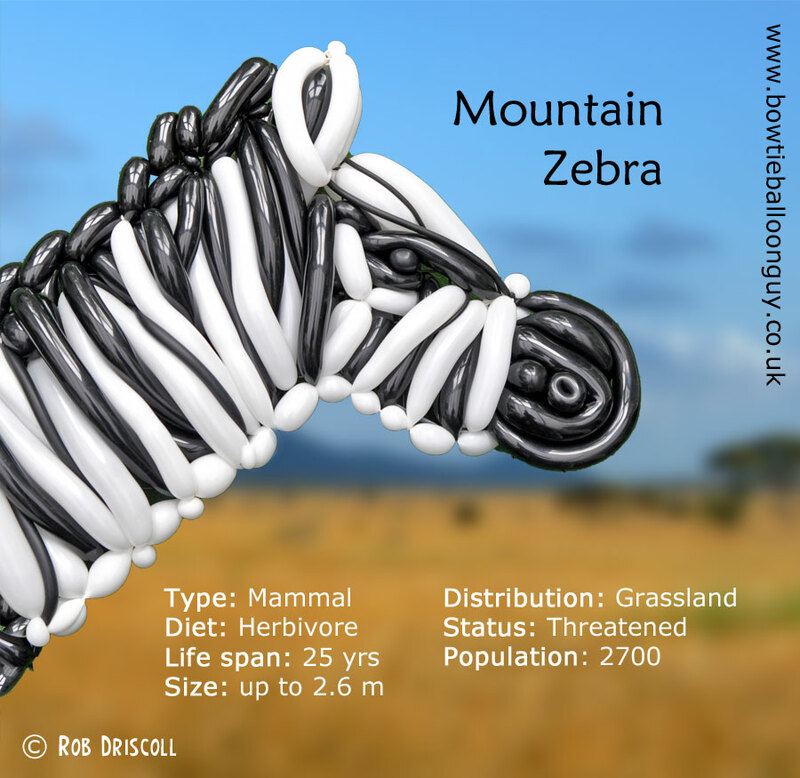 This week is my final week of my Endangered Species project, over the last 26 weeks I have featured a different balloon species for each letter of the alphabet and for my final week and the letter Z I thought I would go for the obvious choice and that would be the Zebra. There are several species and subspecies of Zebra and not all of them are at risk, the Mountain Zebra however is threatened so this is Zebra I am featuring this week. The Mountain Zebra can be found in South Africa and Namibia, they live in small groups and can be found on mountain slopes, open grasslands, woodlands and areas with vegetation, but their preferred habitat is mountainous terrain. In the 1930s the Cape mountain Zebra population was down to just 100 individuals but conservation efforts have saved them from extinction, they are still at threat from hunting, poaching and of course habitat loss so the conservation efforts are on going. There is also a European Zoos Endangered Species Program for this zebra as well as co-operative management of zoo populations worldwide so hopefully the future of the Mountain Zebra is looking positive. Wow, have I reached the penultimate week already? it is week 25 which is the letter Y and that means we take a look at the wild Yak. Before I talk about the Yak I must mention that this weeks design was heavily influenced by the Japanese balloon artist Masayoshi Matsumoto, I spent ages trying to come up with a design for my yak but just couldnt get it looking that good, I remembered I had seen an excellent cow design by Masayoshi Matsumoto so thanks to him for the inspiration, please do check out his work, he is a master of balloon art. The Domestic Yak can be found all over the Himalayas, Tibet, western China and parts of Russia, They have been farmed by humans for thousands of years, mainly for their milk, hair and for meat, Their droppings are an important fuel source and they are also used for sports such as yak skiing and yak polo. The Wild Yak is a slightly different species and it is this animal I am featuring today, they very similar to the Domestic Yak and can be found manly in Tibet, The Yak has very long dark brown hair to help keep them warm, in some males the hair actually reaches the ground, there are however a small number of yaks with golden brown hair and these are a subspecies of the wild yak, it is thought there are just 170 of these golden yaks left. The Wild Yak has suffered in the past from poaching, plus it is thought they have been affected by diseases from domestic cattle herds, the species was classified as endangered however due to the efforts of authorities to prevent poaching and to create nature reserves for the animals the status has been lowered from endangered to vulnerable, hopefully the continued efforts will enable the yak populations to grow. Hello wildlife fans, well we have come to the most difficult week of the whole set, what kind of animal begins with the letter X? I actually had a couple of options but decided to go with a species of bird called the Xantus's Hummingbird. Xantus's hummingbird lives in Mexico in the state of Baja California, if you are wondering , it is the bit of land on the west coast of Mexico that sticks out into the pacific ocean below California USA. Although the species lives in southern Baja California there are a few very rare vagrant populations along the pacific coast of the USA and they have even been spotted as far north as Canada but these are very rare. The Unusual name of the hummingbird comes from John Xantus de Vesey the hungarian zoologist who discovered the bird in the 1800s, while we are on the subject of names I was delighted to find out that a group of hummingbirds has many collective nouns, including a “bouquet", "glittering", "hover", "shimmer", and a "tune” of hummingbirds. Xantus's hummingbird is not strictly endangered, its not threatened and actually has a status of least concern, so why am i including it on this list of endangered animals? well it is because the populations of the hummingbird fluctuate so much that they often reach the threshold for becoming vulnerable, it is not really known how many of Xantus's hummingbird there are and the slightest change to weather patterns, their habitat and food sources could tip the balance at any moment plunging the bird into vulnerable or even worse into endangered status. Hello everyone, I am up to the letter W and this week I am featuring an animal I nearly made for the letter R but for some reason I made a Red Panda instead, thankfully I get a chance to feature it this week, it is a species of Rhino, the White Rhino. White Rhinos are not white, the word white comes from the German word for wide which references the animal's muzzle, they have a very square top lip. Rhinos are the words second largest land animal and the White Rhino is the largest of all the rhinos weighing in at 2.3 tons and are a massive 4 metres in length, that means they are about as big as a car and they weigh twice as much. The White Rhino can be divided into 2 categories, the Southern White Rhino and (no prizes for guessing) the Northern White Rhino. The Northern lives in central Africa and the Southern lives mainly across the southern parts of Africa. Back in the late 1800s the Southern White Rhino was thought to be extinct however a small population of just 100 Rhinos were discovered, with so few of these rhinos left it was decided that they needed to be protected and managed, over the next 100 years the population slowly grew and eventually the animal moved from the Endangered category into the Near Threatened category, there are now over 20,000 of these amazing animals in the wild and the numbers are continuing to grow. Rhinos are threatened by a whole host of things, loss of habitat and poaching being the main two. The WWF is taking a very active role in helping to protect rhinos by helping to strengthen local law enforcements to protect the rhinos from poaching. The WWF is also taking an active role in monitoring the rhinos and the movements of the poachers, using rhino horn DNA analysis (RhoDIS) they are able to get a better understanding into where and how the illegal trading of rhino horn is taking place, it also helps bring the criminals to justice for their crimes against rhinos. Every donation you make to my Just giving page helps save another endangered species, it also helps make a balloon man smile.